Tempranillo is a red grape native to Spain and central to the production of Rioja. It is often referred to as ‘the noble grape’ a sturdy and trustworthy regular and a staple of the Spanish diet. Tempranillo is best known for its dominant role in the production of Rioja, alongside grapes such as Garnacha Tinta, Mazuelo and Graciano. Tempranillo has a fruity – cherries and redcurrants - and sometimes leathery taste. When used in Rioja it tends to produce a very dry and heavy wine. Tempranillo goes under many different names throughout Spain and the New World. Such names include ‘Tinto del Pais’, Tinto Fino and Tinto Roriz (as it is known in Portugal where it is blended with other grapes in the production of Port) and Valdepenas (in California). With the common application of the grape name to describe a wine in the New World, Tempranillo is becoming accepted as the common name for this grape. A very good example of Tempranillo can be bought for just under £3 from Tesco’s and is named ‘Tesco’s Simply: Tempranillo’. Do not be fooled here, price is not everything, and a good Tempranillo can come fairly cheap due to its not being a grape with a particularly high reputation, and because it’s not region specific. There are few historical records of Tempranillo being grown and cultivated in Spain, possibly due the differing names that this same grape appears under. It is certain, however, that Tempranillo has been used to make wine in France from at least the 13th Century A.D. and in all probability for a long time before that. Legend has it that Tempranillo may be a mutated version of Pinot Noir – a grape that it is often compared to (although the wine produced from it is much lighter) – transported to Spain by French monks. Tempranillo as Spain’s main wine making grape was naturally taken with the growth of the Spanish Empire to South America in the 17th Century. 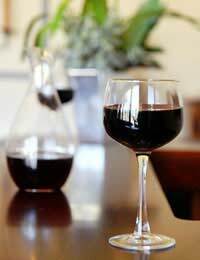 Although Tempranillo has never truly caught on in the New World to the extent that, say, Cabernet Sauvignon or Merlot has, it is becoming increasingly popular in California, and has a good base in Argentina, where it is called Tempranilla and is used predominantly as a blending grape. Spain operates a strict wine classification system, and as such it is felt that the true potential of Tempranillo has been sometimes hindered. For example, whilst recent innovative blends of Tempranillo with Cabernet Sauvignon have produced positive results, such practice would not pass the stringent rules necessary for a wine to be termed ‘Rioja’. This in itself may hinder the cause of Rioja wine, especially as such practice can be indulged in elsewhere! Tempranillo goes well with: Beef; Lamb; Bacon; Pork; Turkey; Duck; Hard cheese, such as Manchega; Edam. For those with a liberal stance on meat eating Rioja is often enjoyed with roast baby lamb! In general Tempranillo is an ideal accompaniment to fruitier, more tender cuts of meats, and also to game. It also may just pass off with a summer salad – certainly with regard to the aforementioned Tesco’s own brand, which if very light in flavour.